There are a couple of formalities that you will need to accomplish before you start your courses. They are rather straight forward but mandatory. So make sure you complete them prior to the start of your program. Upon arrival, within 14 days you must go to your local government office to complete the “Residence Record (Juminhyo)” details. This puts you on local register of people, and has links to your health insurances, pension etc. Your address will also be added to the back of your Residence Card. The Residence Card is a very important document. 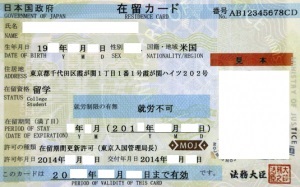 This is your Japanese ID, which can be asked to be shown anytime by law enforcement officers. Make a copy of it and keep the copy safely at home, separate from the original. If you happen to lose the latter, a new one will be re-issued faster if you own a copy. The Residence Card is required for various purposes such as opening a bank account, obtaining a cell phone, converting a driving license etc. It stores the holder’s personal information, including the current address, the status of residence and period of stay. Foreign residents are required to carry their residence card with them at all times. Once the enrollment is completed, you will get a student ID which will give you access to the school facilities. You can then start the courses!